Aosept Plus is a preservative-free hydrogen peroxide solution for disinfecting, neutralising and storing soft and hard contact lenses, especially suited to use with silicone hydrogel lenses. Contact-wearers with sensitive eyes or a tendency to allergies will find the solution highly tolerable. 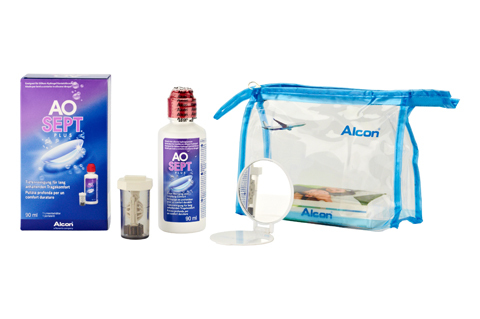 The Aosept Plus Travel Pack contains every thing you need for thorough care of your lenses when you're on the go. Included in the set is a 90ml bottle of hydrogen peroxide solution, a pocket mirror and a pouch to keep everything safe. So you're always well equipped, wherever your travels take you. Even on the plane, as the 90ml bottle is under the liquid restrictions for hand luggage - bon voyage! The hydrogen peroxide solution must be used within 3 months after opening.